In New York, the Clearwater and Adirondack Chapters of TU worked with the U.S. Fish and Wildlife Service and the Battenkill Watershed Alliance (BKWA) on two problems: insufficient large wood and an overwide channel with impaired sediment transport. This before/after series shows how adding wood structures improves habitat in the Battenkill. 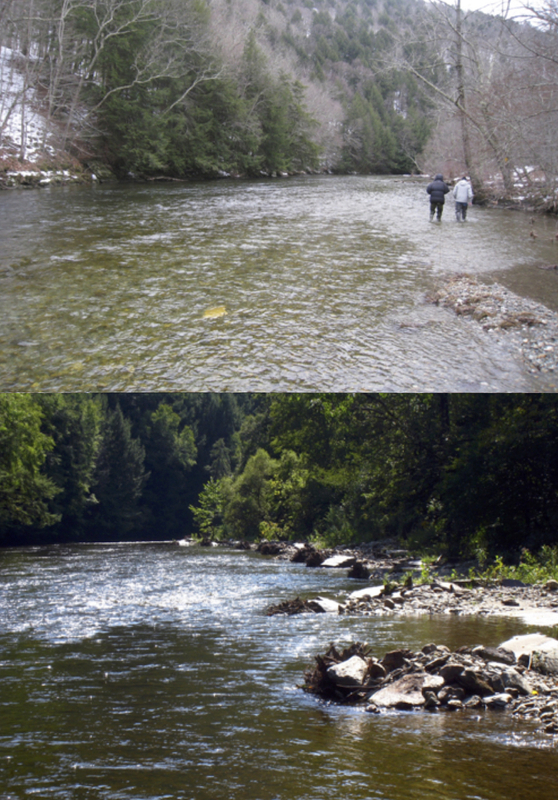 This comprehensive, landscape-based approach will require eliminating barriers to fish passage in tributaries, reconnecting reaches to sufficient floodplains, ensuring well canopied stream corridors and restoring ample habitat with large wood. It's a huge task, requiring raising $168,000 to fund the initial two years of a TU HRI coordinator along with seeking an ongoing funding sources for what is likely to become a 15-plus-year undertaking. Thus far, $40,000 has been committed. The three chapters and the BKWA are now meeting regularly to mount a full scale funding campaign to meet this challenge. Meanwhile, both New York chapters remain engaged in restoration work on the lower river with a two-year project that will add large wood and rock to stabilize an eroding high bank and provide habitat. This TU chapter/BKWA/USFW project is funded by the New York chapters, an Embrace a Stream grant from TU and other sources. Both chapters are also jointly working on other efforts, including: monitoring river and tributary temps; evaluating the health of the tributaries; and using New York’s Trees for Tribs program as a start to restoring riparian canopy. John Braico is the resource VP of the New York State council and a member of the Adirondack chapter. He is a coordinator of TU volunteer effforts in New York, along with Greg Cuda, president of the Clearwater TU chapter.